Kate Kordsmeier is the founder of Root + Revel, a food and wellness site helping people live naturally, without sacrifice. After being diagnosed with PCOS, leaky gut, hypothyroidism and insulin resistance and subsequently healing her body naturally and reversing her symptoms with food and natural, holistic remedies, Kate founded Root + Revel, a site centered around on real, whole foods, safe, non-toxic beauty, effective DIY recipes and healthy living inspiration. 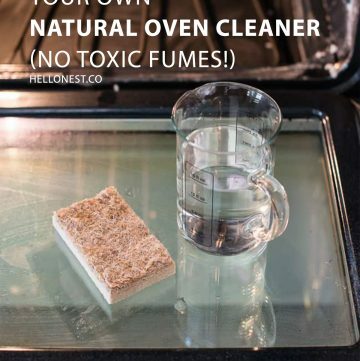 Sign up for Root + Revel’s newsletter to receive a FREE DIY Natural Cleaning eBook. Tomorrow, Matt’s and my house goes on the market. I can’t believe we’re selling our home–it’s where Matt proposed to me. It’s the first house we ever owned. The first renovation projects we took on. It’s where we lived when we got married, and where we’ve created hundreds of memories. Needless to say, it’s going to be tough to say goodbye. To get our house ready to list, we had a few punch list items to go through, including steam cleaning our carpets, which (thanks to our adorable kittens and their less-than-adorable hairballs) had quite a few stains on them. So we went to Lowe’s to rent a professional steam cleaner. But when we got home, we realized we forgot to buy the actual carpet cleaning solution. Doh! Turns out, after looking up the ingredients, we did ourselves a favor. 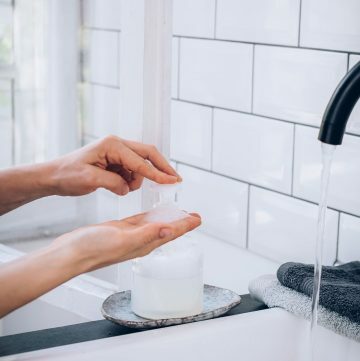 The store-bought carpet cleaning concentrate was full of dangerous chemicals, like cancer-causing alcohol ethoxylates, endocrine-disrupting and allergy-inducing fragrance and environmentally-unfriendly copolymers and methylisothiazolinone. I dare you just to try and pronounce that last one. 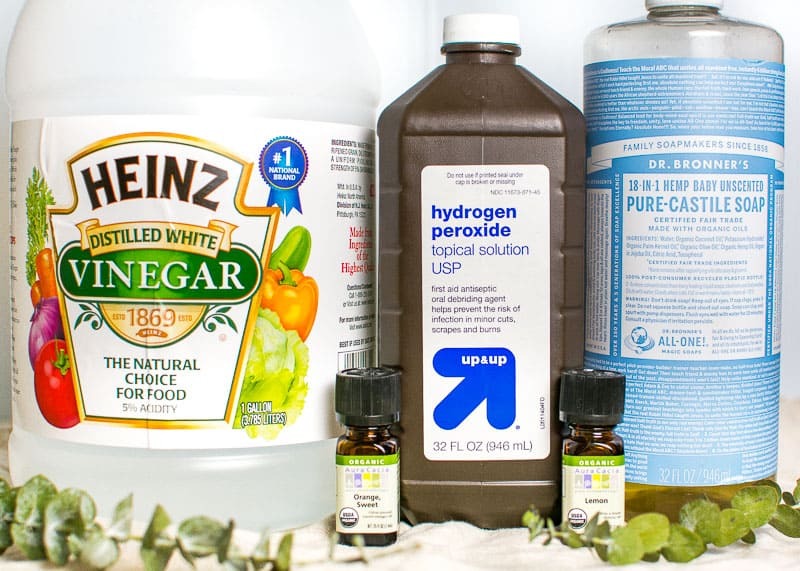 Fortunately, I had all the makings of a super safe carpet cleaner in my pantry and medicine cabinet–all you need is Distilled white vinegar, hydrogen peroxide, castile soap, essential oils (I recommend lemon and sweet orange) and hot water. So I decided to make my own and see what happened. As you can see from the photos above, the results were incredible!! Not only was this DIY Homemade carpet cleaner just as effective (if not more so) than conventional store-bought cleaners, but it was WAY less expensive, infinitely safer and a breeze to make. Once again, I’ve found DIY recipes to be as easy as pouring liquids into a bowl and stirring. 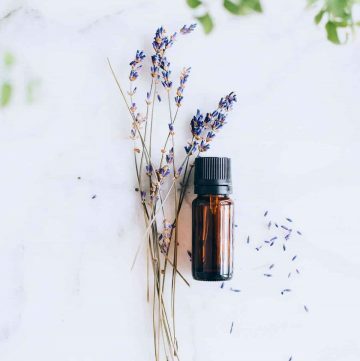 You can swap out the essential oils you use if you prefer a different scent–something about citrus just smells clean to me, but lavender would be beautiful, too. 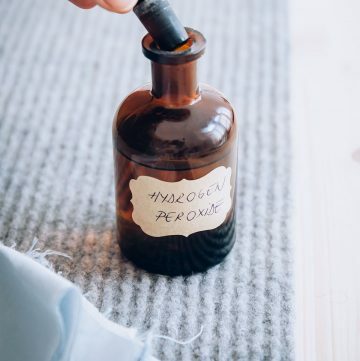 And you don’t need a professional steam cleaner for this to work–I’ve tried bottling the solution and just spraying it directly onto a stain, letting it sit and scrubbing with a bristle brush, and it works just as well. 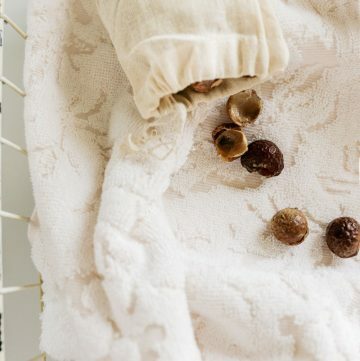 Next time you reach for toxic store-bought carpet cleaner, give this a try instead. And share your results in the comments below. I’d love to hear how it works for you. Happy Cleaning! Combine all ingredients in a large jug or pitcher and stir gently. 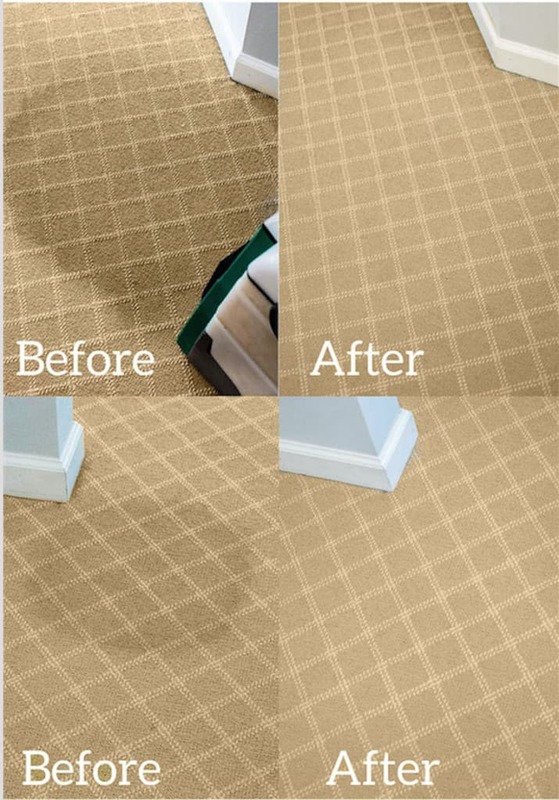 Pour into carpet steam cleaning machine and use according to directions. Or apply directly to carpet stain and scrub with a bristle brush to remove. Thank you for this! I’m going to try it out tomorrow. 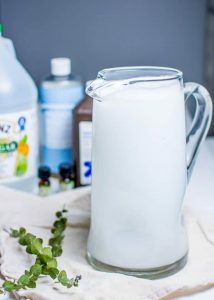 Thank you for sharing this simple yet effective recipe for carpet stain removal, I will definitely be trying this out as soon as possible. Wow. Carpet cleaner is usually expensive, so to think you can just use soap and water for the most part…incredible. Most of the time I use dish soap and it works best when you treat a stain as soon as possible, but I needed something for old ones. Thank you for the recipe! I prefer the vinegar and water solution before I try oxygen peroxide. If the stain don’t budge, depending on the carpet I might try oxygen peroxide next. I’m careful with it since it may cause discoloration. What a great find! I want to start implementing a green approach to my cleaning services since my clients have been asking for it. Thank you!